Yellow dock is a plant native to Europe and Asia. 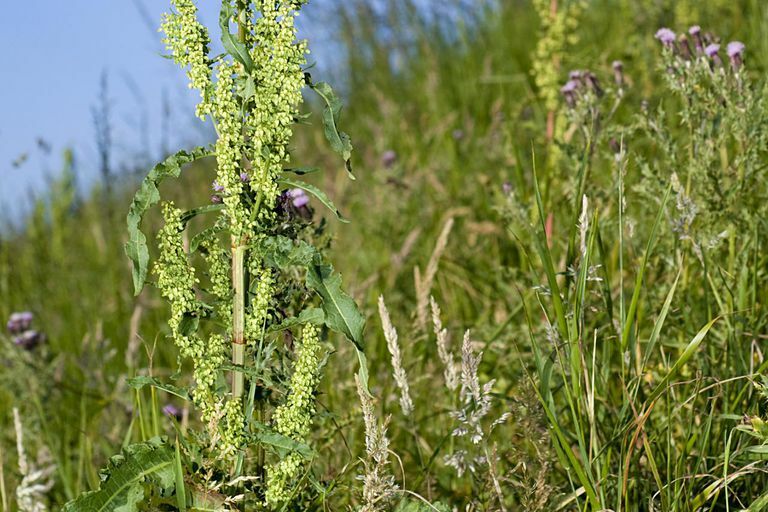 Also called "curled dock" or "Rumex Crispus," it is cultivated as a vegetable in Europe and grows throughout North America as a common weed. Yellow dock leaves are harvested in spring and may be used in salads or other dishes though the taste is somewhat sour. The part used medicinally is the bitter root, though the leaves can also have a mild laxative effect. In traditional herbal medicine, yellow dock is thought to be a general health tonic and helps to maintain proper digestive health. Yellow dock is thought to benefit the digestive tract, liver, and skin and to treat inflamed nasal passages. One of its primary uses by herbalists is for skin conditions associated with poor digestion, poor liver function or "toxicity." It is also thought to be helpful for rheumatism and disorders such as scurvy and scrofula. Yellow dock has a mild laxative effect, due to constituents called anthraquinone glycosides. It appears to stimulate the release of bile and digestive enzymes. However, there is not enough scientific evidence to support the use of yellow dock for any of these health benefits. Due to a lack of research, little is known about the side effects of using yellow dock. Yellow dock contains oxalic acid, which irritates the bowels and may cause mild diarrhea in some people. Call your health practitioner if you experience abdominal pain, diarrhea, nausea, or vomiting. Overuse can cause laxative dependence. Yellow dock should not be used by people with kidney disease, liver disease, or an electrolyte abnormality. Excessive use of yellow dock can cause a blood disorder called metabolic acidosis and life-threatening calcium deficiency in the blood. Call your health practitioner if you experience signs of low blood calcium, such as ​fatigue, seizures, confusion, muscle spasms, and numbness around the mouth. Health experts advise that you should never consume raw or uncooked yellow dock as it may cause severe reactions. Even handling raw yellow dock may cause a skin reaction in some people. There is not enough evidence about yellow dock to establish a recommended dose. Due to the limited research, it's too soon to recommend yellow dock as a treatment for any condition. It's also important to note that self-treating a chronic condition with and avoiding or delaying standard care may have serious consequences. If you're considering using yellow dock, make sure to consult your physician prior to starting your supplement regimen. Yellow dock is prepared for medicinal use as a syrup, a tincture, or an ointment. To make the ointment, which is used for itching and swollen glands, the root is boiled in vinegar; the pulp is then mixed with an agent such as lard. Yellow dock may also be made into capsules or tea. If you consume a yellow dock supplement, practice smart consumer habits when you buy. The National Institutes of Health (NIH) recommends that you look for a Supplement Facts label on the product and evaluate the amount of active ingredients per serving. The label will also tell you about other added ingredients like fillers, binders, and flavorings.